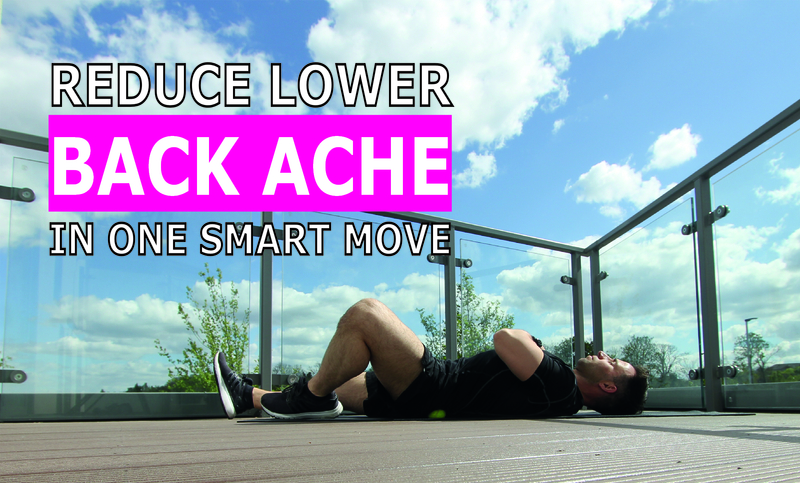 According to a recent report, chronic back ache affects 43% of people living in the UK… 43%! That’s almost 1 in 2 people affected by chronic back pain… So, in today’s post, I would like to offer a few solutions which may help some of you reduce this discomfort using simple exercise techniques. Back ache and lower back pain can be debilitating, and can make you feel miserable. Back discomfort can sometimes be structural (as in physical damage to the structures of the body, such as; bones or the vertebral discs). In other instances, problems can be mechanical which mean the muscles and joints in the body are not working properly. This can then lead to stiffness, tightness and, more often than not, pain. Due to ‘Office Back’ and poor posture, the glutes (buttock) muscles can become weak and inefficient in terms of doing their job of controlling the hip joint properly. This has an immediate effect on the angle of the pelvis and over time, can physically change the normal day-to-day position of both your pelvis and spine. In this scenario, other muscles can ‘take over’ and become dominant in controlling the hip joint. This situation is called a ‘mechanical imbalance’ and ultimately forces the hip joint to work dysfunctionally. In time, this dysfunction causes the back ache you may feel lingering across the lower back. This happens because the hip joint is part of the same complex as the pelvis and lower back. In some cases, the tightness and immobility of the hip has a direct, negative influence on the function of the lower back. In order to get your back feeling better, we must reverse the process which creates this imbalance. For this to happen, we need to reduce the tension and tightness in the muscles. We are going to address this with one straightforward exercise using a simple tennis ball. The type of technique I’m going to show you is referred to as Self Myofascial Release. It reduces the aches and pains in our body by reducing the tight, tense state our muscles can find themselves in. Be warned though, manipulating a muscle in this state can be a little uncomfortable. Mild discomfort is perfectly normal, sharp or nervy achy sensations are to be expected. Lay on your back and place one hand underneath your pelvis on the opposite side of the body to which we will be rolling with the tennis ball. 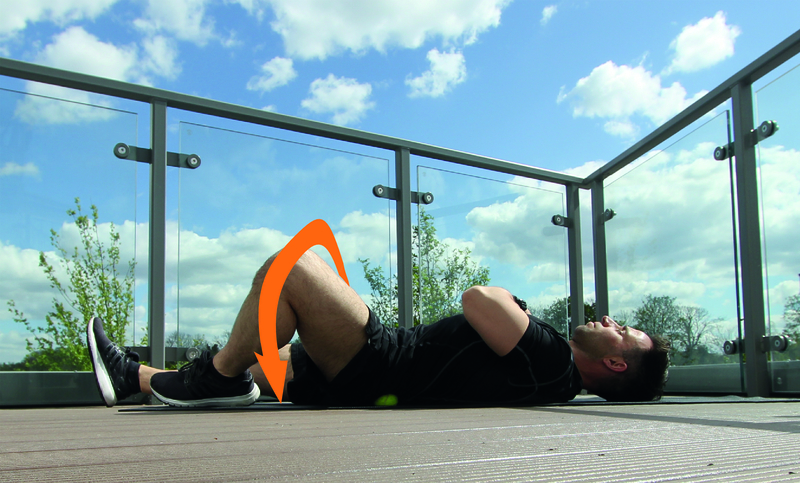 This will help maintain a flat back and stop you from laying twisted while the tennis ball is underneath your hip. Place the ball in the area which forms the top and outside of the buttock muscle which sits just above the hip bone. You may have to adjust the position as you perform the exercise to ensure you find the right spot to work on. With the knee bent and the foot flat to the ground, open the hip outwards. The ball will press into your tight muscles deep in the hip. From this position, slowly open and close the hip in a fluid but slow, controlled movement. If carried out correctly, you will relieve any tight, tense muscles with a simple tennis ball. The second technique uses the same start position as the first. This time, however, we’re going to lift the foot off the floor and rotate the hip so the knee goes from a straight leg, out to the side, up to the chest and then out straight again. This will work deep into the hip muscles and help iron out any tension which may be contributing to your back pain. If these exercises don’t offer you the remedy you are looking for, you may need to work into the back itself. Check out my post ‘How to Fix Your Sore Office Back’ for a full tutorial on how to use other techniques to reduce back aches and pains. 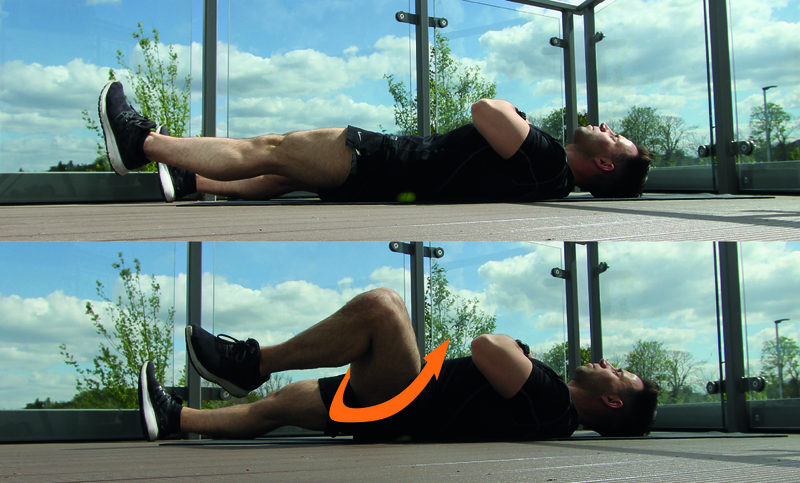 In addition, once you have reduced the tension you should be moving on to a structured stretching programme. This will help increase the muscle’s length and overall joint mobility. Longer, more flexible muscles hugely reduce the chance of pain and discomfort around the joints. Strengthening the back will also help. As the muscles develop in strength the likelihood of you experiencing reoccurring back ache will diminish. This will leave you feeling younger, more athletic and with an improved physical performance.